This Killer Green Smoothie is a great way to eat your veg and enjoy all the benefits of immune-boosting greens. Greens like spinach and spirulina are rich in minerals and chlorophyll, which aid detoxification and help reduce inflammation. This is especially important if you are an athlete or have a daily yoga practice as it will help speed up the recovery of your body’s tissues. Spinach is also a great source of protein, which is an essential building block for your body to renew itself after a work-out. Spirulina, a natural “algae” powder rich in immune-boosting nutrients, is even higher in protein than spinach. Ginger is a very powerful anti-inflammatory food which is especially good post-workout where natural inflammation and scar tissue may occur. Pineapple contains an enzyme called bromelain which can help improve digestion. Avocado is rich in healthy fats that help keep inflammation under control and promote heart health. 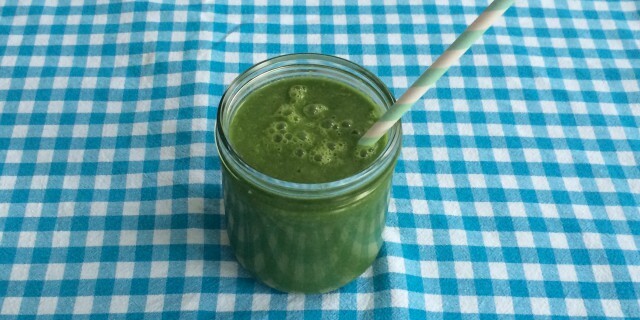 Enjoy this Killer Green Smoothie as a healthy breakfast to start your day or drink it after a run or your yoga practice! Add all your prepared produce to a high-speed blender, pulse until a smooth consistency and enjoy right away!